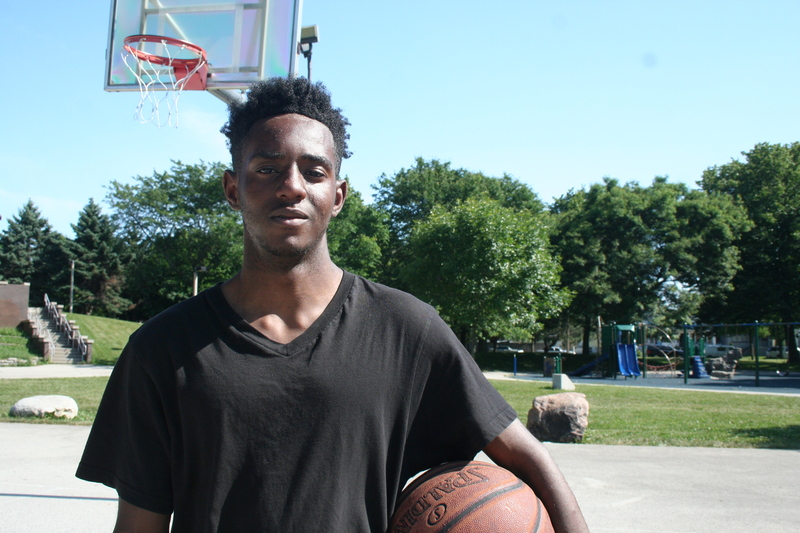 Terryon Mckinnie shoots a basketball on an empty court in Tiefenthaler Park in Milwaukee’s Midtown neighborhood while a group of men and boys play a hustle on the court beside him. Mckinnie says he would rather practice than join in — there are too many people and Mckinnie, who has a slight frame, doesn’t want to get hurt. Mckinnie’s father is unemployed but worked as a construction worker; his mother is a care worker for the elderly, just like his sister. “I can’t describe them but I know they’re caring,” says Mckinnie as his phone rings. It’s his mother. He tells her he’s at the park “hoopin,’” which she doesn’t quite understand until he clarifies. “I’m playin’ basketball,” he says, finally giving in. “When I look at the word, it just … like, when I look at a big word, it’s just like, ‘man, this a word?’ My teacher, she helps me, like, pronounce the words and stuff, like ‘enthusiastic,’” Mckinnie says, with a hint of self-consciousness as he sounds out the word. “I had trouble … my mind, it don’t … I read, like, certain words and stuff but it just like … longer words, I need help on,” says Mckinnie, who attended a reading group at the Boys & Girls Club over the summer. “I’d use that money to get me a house, help my family out … if I had kids I would take care of them,” he says. But he’s not ready for kids, yet. Maybe at some point, he says, but not yet. Did you find value in Terryon’s story? If so, please subscribe to our newsletter; we publish the story of a different Milwaukeean every week.